Evolution of the game over 1 year. Actually, everything started in April 2013, when I had just started to write little projects in Unity. 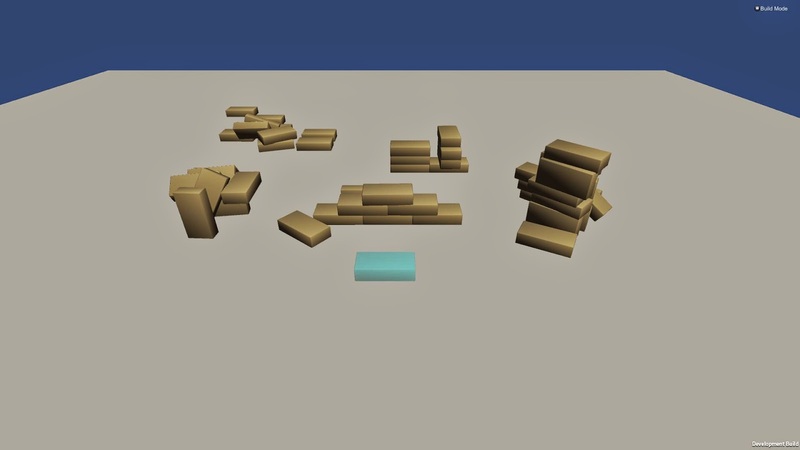 In one of them I played around with some physics objects and had the idea to create a game with physics and blocks and so I coded a small prototype which consisted out of a plane and blocks which you could place on it. First prototype of a physics based game (One day of coding). was to place them on a plane. At that time I didn't have a plan to create a bigger game and I didn't continue to work on it. Nothing happened for several months until July when I picked up the idea again and started to create a concept of a game which soon became Brick Inventions. The concept didn't contain many thing which are in the game now and I had originally planned to release the game by the end of 2013. So on the 12th July 2013 I released the first video of the game and set up the blog. The game was far from being finished at that point and I planned to create update-videos on a regular basis. In July and August I focused on implementing the core mechanics and different game-modes. In that time I released videos showing the Sandbox mode, the Inventor Mode or the Join-tool. In September I wanted to change the resource-system of the game. Until then, there were producers at fixed locations on each map which was kind of boring. After the new system was in place, I took care of several smaller things on the to do list (Tweaking physics, creating an option menu,...). It was also the time when I realized that the game was getting bigger and bigger as I had many new ideas I wanted to implement into it. So I created a new roadmap and moved the planned release date to 2014. In the next months I implemented new blocks to the game which sometimes was a really tedious task as the code I've written before didn't support many things which I needed. In January 2014 I decided to stop adding new blocks and instead move on to more important parts of the game in order to get it finished. Since then I've added textures to all of the blocks, fixed bugs, added the first multiplayer-map (I'm currently preparing a second one ;) ) and did changes in the background to get the game ready to be played. Last but not least I want to thank everyone who has followed the project and has given me feedback, it's been an awesome journey. I have already learned so much in that year and I hope the game won't disappoint you.